Cherry season has come a little later than usual this summer but that’s completely fine by me! The long wait has been worth it. For some reason they taste sweeter than I remember. We’ve been bartering Tumbleweed Farm veggies for them every week at the market since their seasonal debut a few weeks back. And while we prefer eating them straight up as an afternoon snack I’m already thinking ahead to the fall/winter when warming up with a cocktail of sorts is what we’ll be craving after a long day. I’m an Old Fashioned kind of gal but these bourbon cherries would taste great in a variety of drinks—sparkling wine, Manhattan’s or even topped on some ice cream for dessert. They’re simple to prepare and last for months in the fridge (as long as they’re completely submerged in the simple syrup). I was inspired to make these when a friend gifted me a jar at my book signing this past spring. I loved them so much and knew that once cherry season was upon us I’d crank out a few jars. I’m so happy with how these have turned out, and they’ll continue to get better the longer they marinate in the fridge. Sterilize your jars in boiling water for 10 minutes. Don't boil the lids but instead add them to the water after it's boiled and let them sterilize for about 5 minutes in the hot (not boiling) water. Using a cherry pitter remove the seeds from the cherries and set them aside. Lightly crush the cardamom pods with the back of a spoon to expose the inner seeds. In a medium size pot over medium heat, toast the pods until fragrant, about 3 minutes, being careful to not burn the pods. Add the honey and water. Bring to a boil. Quickly reduce the heat to low and simmer for 5 minutes or until the honey has dissolved. Remove from the heat, add the bourbon and vanilla extract. Allow the mixture to slightly cool. 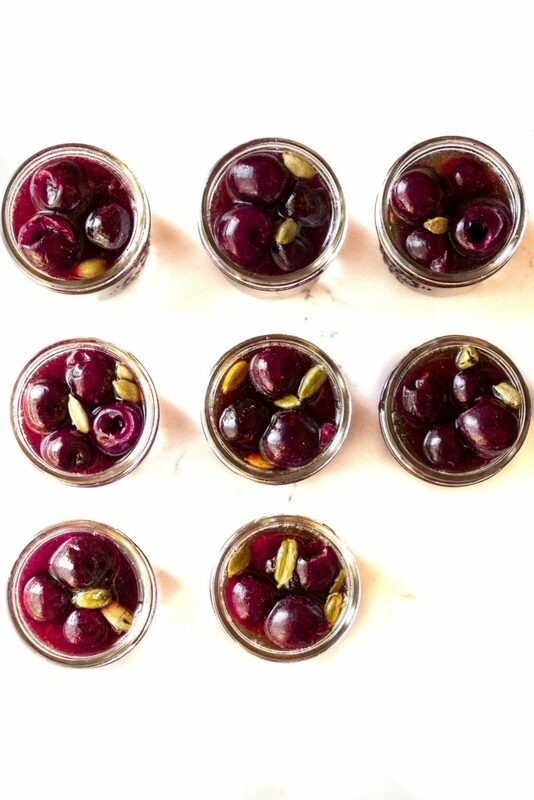 Pack each of the sterilized jars with cherries. Divide the honey/bourbon mixture between the jars (making sure that each jar gets at least one cardamom pod in it.) If the syrup doesn't quite submerge the cherries add more bourbon to completely cover the cherries. Secure with lids and keep in the fridge for 3-4 months (see note below). *Due to the high alcohol content these can last for months in the fridge as long as the cherries are completely covered. Additional bourbon can be added to the jars if the syrup depletes over time. These sound absolutely delicious! Another great recipe! So happy I stumbled upon your site! Your recipes are very intriguing; and I love your story. Thanks for sharing! This sounds amazing! So my problem is…. I have ground cardamom, not pods. Would it be possible to use it in place of the pods, and if so, how much? I’m thinking not, but thought I’d ask since the pods were a little pricey for one ingredient that I don’t use often. Thanks! I’d recommend going to the bulk section of your grocery store and getting just enough pods for this recipe! I don’t think ground cardamom will work as well here. But you could try it with 1/2 teaspoon in the simple syrup. These look delicious! I’d love to make them as Christmas gifts but I’m sure if they’d keep until then. Any thoughts? Yes! Sorry for the slow reply but these should last months. As long as they’re completely submerged in the liquid they should be good to go. I have the 3-4 month as a “safety” number but realistically these will probably last up to 1 year in the fridge if in good condition. I know it’s a million degrees out, but I just made these-I can’t wait till Manhattan season! Going to make more and keep for Christmas gifts. Thank you!! !